Sleek and ultra-slim, the ZENS USB 5W Single Wireless Charger is designed for fast, wireless charging. Charge any Qi-enabled smartphone without plugging in – just drop and go. Charge at home, in the office or on the go – wirelessly, effortlessly. 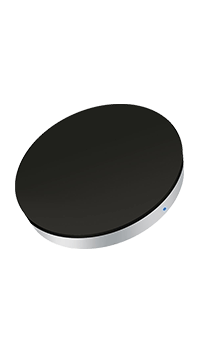 The USB Single Wireless Charger by ZENS works with any Qi-enabled smartphone. Compact and ultra-slim, the ZENS USB 5W Single Wireless Charger is designed to fit your pocket, your kit bag or your carry-on. No more awkward manoeuvring to use your phone when it's plugged into the mains. Just drop your Qi-enabled smartphone anywhere on the charging pad for power. Effortless. The ZENS USB 5W Single Wireless Charger requires minimal charging, thanks to ultra-low power consumption when it's set to standby. When you do need to charge it, simply plug into a socket.